This Loose Change article is by David Taylor who blogs about his money-saving journey at Thinking Thrifty – everything from snapping up reduced food in his local supermarket to renovating a café for under £500. I’m a big old hater of charges, can’t stand the horrible things, whether that be the ridiculous bank charge for sending you a letter and not paying your bill, or rip off shipping prices that are there with no other aim than to increase profit margins for the seller. However, there is one charge set to be banned that is going to severely kick me in the wallet. From January 13th, 2018, no UK business will be allowed to charge you for using ANY credit or debit card under ANY circumstances. As a money blogger you may well be asking yourself why I would be in favour of any charge, let alone one inflicted upon the everyday consumer daily. Well, the answer to that is very simple, back in April I invested in a cafe after being made redundant by my previous employer. The cafe’s in an area with lots of competition and has to be competitively priced to stay afloat. I sometimes work twelve hour days with no pay in the quiet periods of the year. 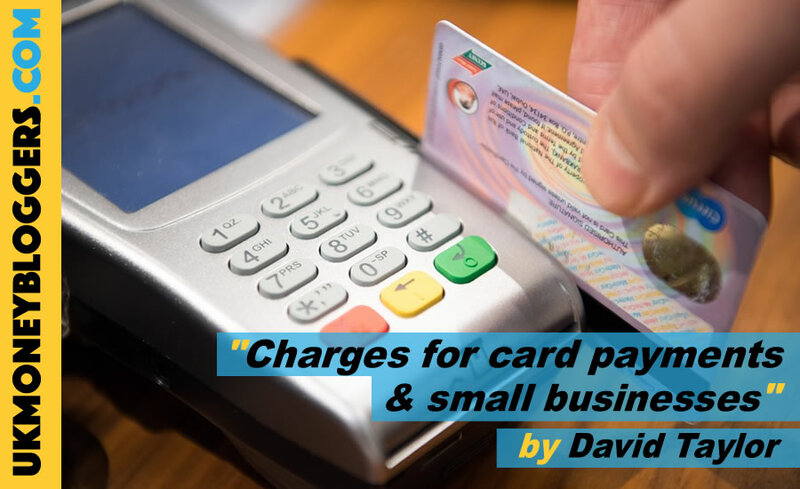 What I can’t afford to do is pay a charge for the convenience of a customer using their card, really, I can’t, and – trust me when I say – I’m not alone. Smaller transactions, on average, come with a whopping 25% charge. Let’s take a bottle of Coke as an example. Right now that’s going to cost you £1.30 at my place. After paying for that bottle of Coke at wholesale and all my other overheads on top, do you honestly imagine I’m making any money if I’m expected to pay another 32.5p on top of that? You get your goods, but I’m making a loss. It gets worse, not only have I made a loss but I have to wait longer for that money to hit my bank, in the meantime, I still need to buy stock. How long do you think my business would survive on that basis? Small business owners generally work longer, earn less and do not have the luxury of holiday pay. Keep making it harder for them to earn a living and local small businesses will become a thing of the past with the high street turning into one soulless big chain after another. Either that, or you are going to see prices rising with an American style service charge to cover costs. The problem with that is that charge is going to be added to everything, so where presently there is no charge if your bill is over a fiver, you would suffer from the new service charge regardless of the amount you spend. You’re also likely to see card machines disappearing in some establishments, being replaced with hired ATMs which offer a profit share for the owner and the ATM provider and come with a much higher cost than a card charge. There have undoubtedly been people abusing the charge, adding on far more than is needed to cover the cost, it’s also despicable that big corporations already afforded attractive tax breaks are able to pass it on to the consumer. And don’t even get me started on HMRC. The problem is, as with the benefits scandal of this Conservative government, to catch a few unscrupulous people, you end up kicking honest folk in the teeth too. Support local business in your area, but please, under new rules and regulations try your best to take cash with you if you’re not expecting to spend much. The fear is with no charge it’ll encourage card payments even further. Speaking from my personal circumstance, I would have to give great consideration to not accepting any cards anymore. Yes, I’ll definitely lose some custom, but if that custom is making me a loss, ironically, I can’t afford the custom anyway.